The evidence of the existence of a long range rocket is reviewed; this evidence comes mainly from three types of source: secret agents, prisoners-of-war, and photography. 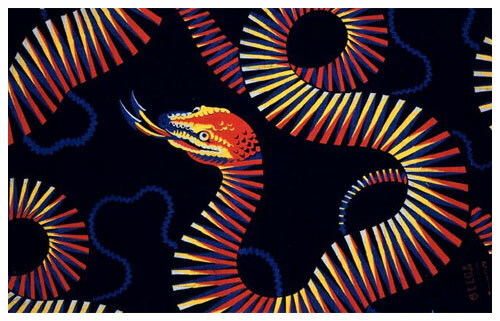 Collateral evidence from other types of source is considered. 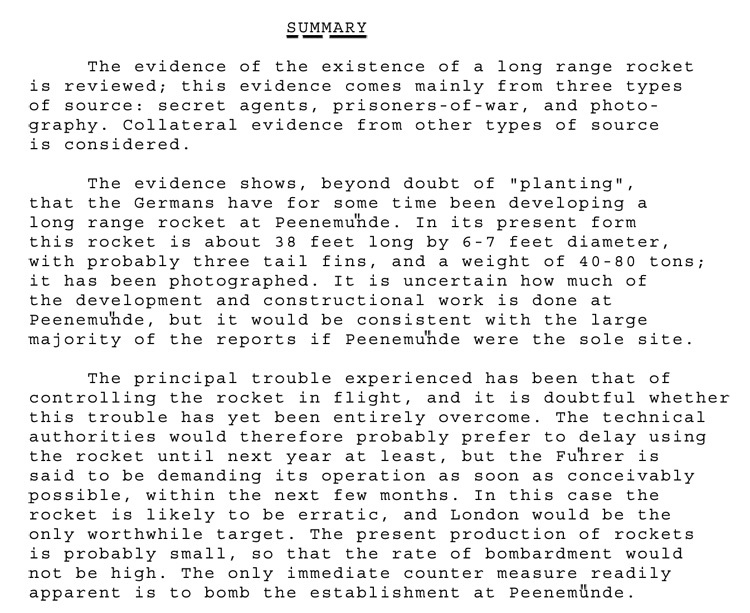 The evidence shows, beyond doubt of “planting”, that the Germans have for some time been developing a long range rocket at Peenemunde. In its present form this rocket is about 38 feet long by 6-7 feet diameter, with probably three tail fins, and a weight of 40-80 tons; it has been photographed. It is uncertain how much of the development and constructional work is done at Peenemunde, but it would be consistent with the large majority of the reports if Peenemunde were the sole site. The principal trouble experienced has been that of controlling the rocket in flight, and it is doubtful whether this trouble has yet been entirely overcome. The technical authorities would therefore probably prefer to delay using the rocket until next year at least, but the Fuhrer is said to be demanding its operation as soon as conceivably possible, within the next few months. In this case the rocket is likely to be erratic, and London would be the only worthwhile target. The present production of rockets is probably small, so that the rate of bombardment would not be high. The only immediate counter measure readily apparent is to bomb the establishment at Peenemunde. 1. Read Sources 1 and 2. You must advise the War Cabinet on the threat level from three sites: Peenemunde, Wissant and Watten. These sites are believed to be part of the German rocket project. Read the documents and then answer the questions. Is Peenemunde part of the German rocket project? Should it be bombed? Give reasons for your answer. Is Wissant part of the German rocket project? Should it be bombed? Give reasons for your answer. Is Watten part of the German rocket project? Should it be bombed? Give reasons for your answer.How good was the advice you gave? There was clear evidence that the Germans were developing a long-range rocket there. This site was so dangerous that it had to be attacked as soon as possible. While answering yes is not completely wrong, it was decided not to bomb the suspected launch sites at the time. This site turned out to be where the fuel was put into the rockets. So it was very dangerous and had to be attacked. Excellent, you could not have given better advice. If the Germans were allowed to develop their missiles and rockets, then huge destruction could have been caused to British cities. You are going to be promoted. Well done, you have given good advice. If the Germans were allowed to develop their missiles and rockets, then huge destruction could have been caused to British cities. You have given poor advice. If the Germans were allowed to develop their missiles and rockets, then huge destruction could have been caused to British cities. You are in danger of being transferred to the Ministry of Food where your job will be to give advice on nothing more serious than how to make tasty meals using powdered eggs.